Summer vacation starts today in my part of the world. More than two months of long, languorous, warm days stretch ahead. Last week Big Sis's school had a small ceremony marking their moving up to sixth grade which is middle school. She and her friends were pretty upset to bid good bye to their teacher and there were much tears and hugging. Come September we will be adjusting to a whole different school routine, attitude and hormones. Little Sis also moves to first grade and there will be another school and routine for her too. Hopefully no hormones there. But we will think of all that later. For now, we will only think of long lazy days. I love summer vacations, even when they are not mine and my daughters'. Now, as I have said many times, BigSis loves Paneer. This is probably the one thing in food, toward which her loyalty has not wavered over the years. 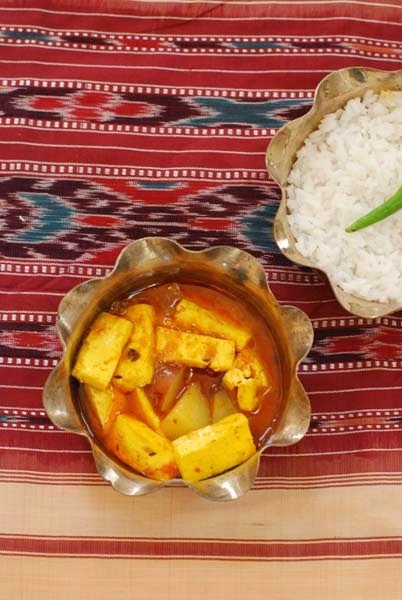 Paneer in Chhanar Dalna , Butter Paneer or Palak Paneer. She loves them all. In most other case, her food choices have changed, taking its own shape, gently molding the menu I try to set. While as a child she used to love her "Chicken Jholu Bhatu" these days she does her best to avoid all kinds of meat. She is no longer fond of fish and eats egg just to get by. I have no idea where she gets here vegetarian traits from but her love for aloo posto, tauk er dal and kadhi sure comes from me. And yes, her love for Paneer is an almost exact replica of my love for Chhanar Dalna. Chhanar Dalna and Posto would be a staple in our home on Fridays. 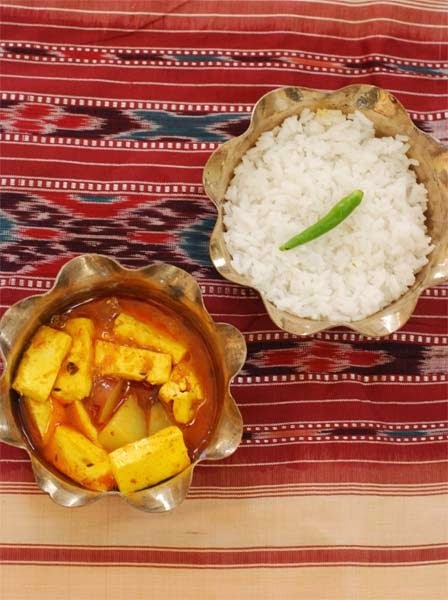 It would also pop up twice or sometimes thrice in the course of the week but if it was Friday then it was almost sure that Chhanar Dalna was on the menu. There was a reason behind this. On Fridays, my Mother kept a fast and therefore did not cook any meat or fish on that day. For some reason unknown to me, she felt that one day of not having any protein would render us weak and feeble. Trust me, there was not a sign in my health to make her believe such. But she steadfastly did. And according to Bengalis that protein can never ever come from a "dal" or lentils. So, my Mother made Chhana. Dilligently. Week after week. She boiled whole milk and squeezed lime juice in it until the milk had a rent and tore apart to form blobs of white cotton like milk solids suspended in a greenish whey. She then drained the whey out on a piece of starched white cloth, usually cut from one of one of her old saris and washed and dried to act as a cheesecloth. That paneer or chhana then rested under the weight of our black stone nora until all the water was squeezed out. The soft chhana was then molded into rounds and fried to golden brown only to be dunked into a slightly sweetish gravy of potatoes and spices. This was Chhanar Dalna. And I loved it so much. Now, I never make a Chhanar Dalna with home made chhana or paneer. Come on, why is Nanak there for ? They really make the best paneers and it works perfect in my Chhanar Dalna. Of course if you are dilligent like my Mother, you would turn up your nose at the very thought and make home made chhana. Whatever you do this Chhanar Dalna will turn out precious. 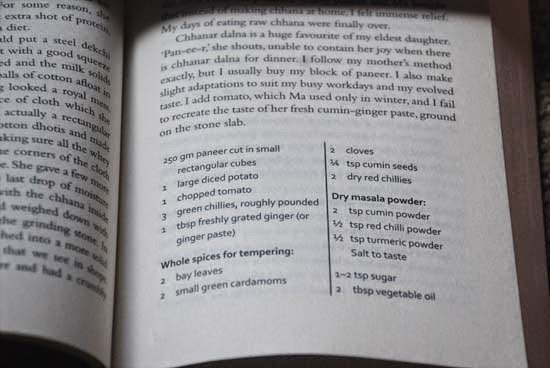 Since the Chhanar Dalna recipe is already in the book, I am just posting it straight from there. In addition to the the steps listed there, I will give you a suggestion. Jut before taking it off the heat, add about half a tsp of ghee. It will take the dish to another level. Middle school does bring a whole lot of change. One of us here at Chatoveracuppa can surely tell you that. First grade should however be just fine. Chanar dalna, a staple in many Bengali homes and ours while growing up. Today paneer has largely over taken it. However while reading your back, as I chanced over it, I made it in fond remembrance of my Didi. I made it after God knows how many years. It stirred nostalgia. That is what your book does many a times. 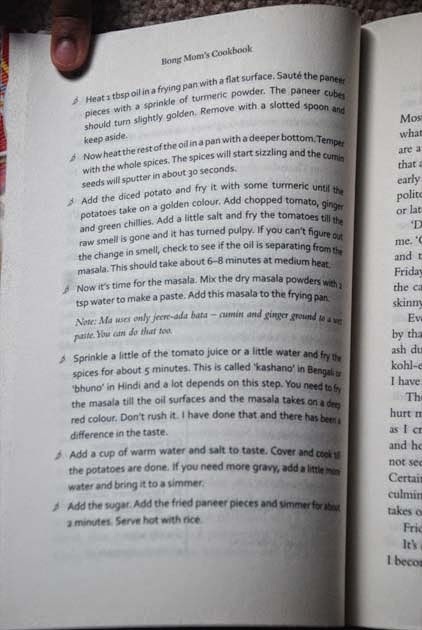 That is an wonderful reading on food..(Cooked your dalna many times and relentlessly and wont add much here) . And most of these had to be sourced from animals , even fish alone cant give all. Egg, milk , red meat are good source and now soya protein is considered as a good source also. So Mom had ensured, and you are also ensuring that the kids eat right kind of protein, till they become 18.. After 18 , we eat 50-70% excess food than we need ..and the net result you know , ha ha ..Bhalo theko .. 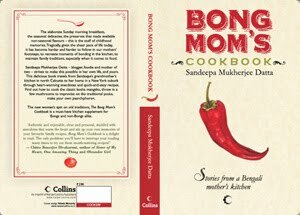 I recently took my vegetarian sister-in-law out to eat at a Bengali restaurant here. We ordered this dish and we were really taken aback because it was all sweet and tomatoey. There was no spice in it at all and they may have used tomato sauce. I thought of you then and was thinking 'when I made it from this blog, it wasn't like this' and then I realised I had made dhokar dalna and not this. Tomar ma-er chhanar dalna ta is exactly how I make it! My problem is my husband doesn't eat paneer (only home made chhana for him). On the other hand my daughter (who has the same name as Big Sis) will have only paneer. Both my children don't like aloo in paneer, courtsey being brought up in North India! Ki kori bolo toh! For the kids you can make same without potatoes na ? Or maybe just put in a little and don't serve them the potatoes. 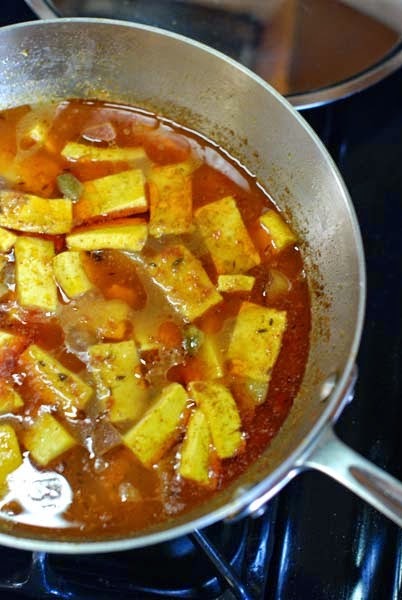 Very nice paneer recipe for kids.